"Do You Sell Any Christmas Lights that are Made in the USA?" That's a question that we hear frequently at Christmas Designers, and truthfully - though we'll admit that we may get a bit tired of repeatedly answering that question - we're not really tired of hearing the question. The reason is because that question indicates some good things. It shows that our customers are a cut above the masses, flocking to the big box stores each season, eagerly buying the cheapest Christmas lights they can find. It shows that our customers are smart enough to recognize that price is only one consideration of many in determining the true worth of a product. And yes, it shows that our customers want to support the good old USA. You can't buy them from us, or from any other business that sells Christmas décor. Spend time searching for them if you wish, but you won't find American-made Christmas lights for sale anywhere. And the reason for that is also very simple: American-made Christmas lights simply do not exist. Christmas lights were invented in the U.S. And for many years, American manufacturers dominated the market. But the forces of global economics have made it impossible for U.S. manufacturers to profitably compete in the manufacture of Christmas lights (and many other products, for that matter). There are some indications that that might change at some point in the future. In at least some industries, manufacturing is making a comeback in the USA. So it's possible that there will be a revival of American Christmas light manufacturing in the future. But for now, if you want Christmas lights, you're going to have to purchase lights that were made somewhere other than America. And yes…in most cases, that means China. Are Chinese Made Christmas Lights Inferior? Chinese manufacturing has gained a bad reputation in America. Many Chinese manufacturers have earned that reputation, but not all Chinese manufacturers. The truth is that it's very possible to buy top-quality products from China. We know, because we sell only top-quality Christmas lights and all of our lights are sourced from China. 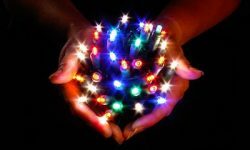 Should these issues be of concern to you as a consumer of Christmas lights? Yes, because they are very real issues. You should be concerned about them and the company you buy your lights from should also be concerned about these issues. The vast majority of Christmas lights on the market these days are sourced from China. No matter where you purchase your lights, you'll almost certainly be buying lights originating from China. That includes the big box stores. Buy from them, and you'll be buying lights made in China. And that also includes us. Buy from Christmas Designers, and you'll be buying lights made in China. But here's the difference: Most retailers are selling you the cheapest lights they can find - and that's certainly the case with the big box stores. They can sell you the lights so cheaply because they buy them so cheaply from bargain basement, corner-cutting manufacturers. So all of those concerns about Chinese products? They're very well founded for shoppers buying their Christmas lights from the mega-retailers. We approach the process of sourcing our Christmas lights very differently from the mega-retailers. Our primary focus is not price. Price is a factor, of course. But it's not the only factor. Instead, we're looking for quality - quality of construction and quality of the materials used in the manufacture of the lights. And we're also looking for companies that treat their workers fairly and provide a safe and healthy working environment. We don't want to be in partnership with any company that abides by a different set of business ethics than those we hold as our guiding principles. How do we know that our Chinese suppliers conform to our high standards? We confirm it the old-fashioned way, with boots on the ground, so to speak. We visit every single supplier before we enter into contracts with them. We confirm with our own eyes that their standards are in sync with our standards and we continuously verify that their standards remain in sync with ours by conducting visits to factories on an annual basis. And we're not only verifying quality-of-product standards. We're also verifying the standards with which our manufacturing partners treat their workers. We're verifying their standing as corporate citizens of the global community. Hopefully, the Christmas light industry will one day be reborn in America. If that happens, we'll definitely support made-in-the-USA Christmas lights. If they become available, we'll sell them. But for 2015, we hope that you will continue to only buy the best for your home or business, which means buying from a reputable seller, such as Christmas Designers, that spends time on the factory floors in China making sure that every supplier adheres not only to quality product standards, but also maintains a safe and hospitable working environment for their employees.